The Jeep Grand Cherokee and I recently encountered one of the more frightening aspects of Southern California driving -- getting trapped by walls of traffic while stopped behind a disabled car. Traffic slows. You assume it's the familiar stop and start pattern we all love (hate) and before you realize it, you are stopped behind a train of cars and its too late -- the traffic is whizzing by you on both sides with no intent of stopping. This is what I get for picking a lane and sticking to it. In this situation you need acceleration, responsive steering, the ability to see what's going on behind you and some nerve. I chose the left side because I could see much better in the driver's side mirror. This would have been truly terrifying attempted in a reduced-vision vehicle. After a minute the gap ahead of me opened up enough so I wouldn't need to make a sharp, acceleration-killing turn into traffic. Another 30 seconds or so and, finally, daylight. I'd like to write something colorful here like, "The engine roared, the chassis leapt forward, and I shot the gap to freedom on the 110 freeway!" In reality I hit the accelerator, turned slightly left, then fluidly right and began accelerating forward -- putting the stopped car and mess in my rear-view. The drama lasted under 3 minutes, but it felt like 30. In that time you relax a little knowing you are in a large, heavy (read safe) vehicle with plenty of pickup that's easy to control. The Jeep passed a test I hope will not be repeated. 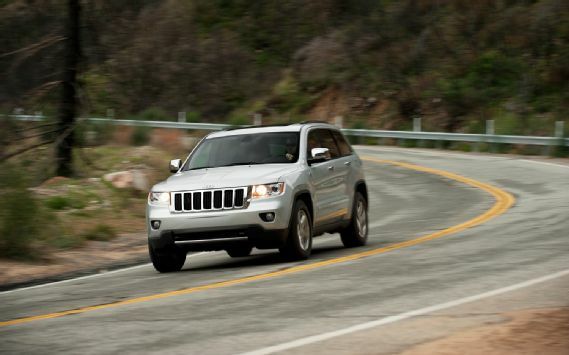 Jeep Grand Cherokee: "Doorless Wonder"